In my last post, I described conquering my fear of the laughing clown at the Forest Park Highlands in St. Louis, where our school picnic was held each year. Of course, I had a little help from a friend. 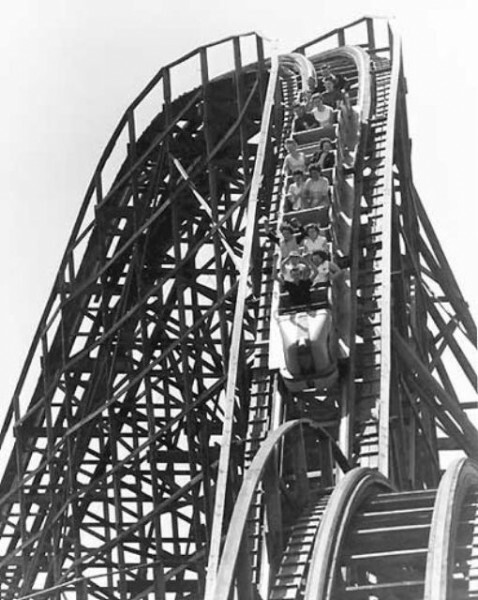 But there was a much bigger milestone looming on the horizon – and I do mean looming: the Highlands’ famous and beloved wooden roller coaster, the Comet. It was a fine roller coaster – fast, rattle-y, with huge drops and even a tunnel, which was unusual for the time. It was also pretty scary for a little kid. I can’t remember if the criteria for riding was age or height (oddly enough, I think it was age). I wanted to be a big kid and ride it. But I was also pretty darned scared of it. The screams coming from the riders in action didn’t help. But all the cool teenagers rode it (over and over again, because you could re-ride without standing in line again – all you had to do was have another ticket in your pocket). I was also motivated by the fact that my sister could already ride it because she was one of those cool older kids. Just as I had with the laughing clown at the Funhouse, I vacillated between longing to ride the Comet and fearing it. My Dad knew just what to do. He said that he would ride it with me. I can remember our walk to the Comet and my Dad chatting away about how much fun it would be. I had a great Dad. He was the Dad who always drove my friends and me to parties and school events. He taught me to drive – taking me to cemeteries where there were roads, but no traffic. He was sympathetic. He liked to tell jokes and use wordplay, but truthfully, he never acted the way he acted that day. For one thing, I don’t ever remember him riding any of the rides. Parents usually held court in the covered pavilion, protecting the picnic lunches, while the kids roamed freely. But that day, he wanted to ride the Comet. As we approached the wooden behemoth. Dad’s attitude was very casual. My legs felt like wooden sticks. But still, I wanted to ride. When we got to the platform, we had to wait a long time, because all the cool teenagers would hold up their tickets to re-ride. You had to wait a long time on the platform before you got a seat. Too long for a little girl who was torn between proving she was a grownup (well, not reallly) and fleeing. But Dad just chatted away and was breezy and relaxed. Finally, we got a car. Thank goodness it wasn’t a front car. Before long, I’d fight to get the front car, but it’s not a great idea for the first time. I can still hear that rattle-rattle-rattle as the car lurched forward. Dad just looked at me and smiled. The rollercoaster climbed – and oh, that first drop was a doozy. “Scream,” Dad told me. And my father, for the first time I’d ever heard, he screamed. I screamed, too. Every drop, every turn, he’d scream. This was my father, whom I never saw shed a tear until many years later. My father, who had fought in the worst of WWII: the Battle of the Bulge in Patton’s army. My father, a business man who also built things with his own hands on DIY projects ranging from laying bricks and stones to building a whole family room on the house and roofing it. He transported tons of rocks by hand one summer. He screamed and I screamed right along with him. Through sharp turns and unpredictable drops, we screamed and then, he took his hands off the rail and waved them in the air. “No hands,” he said. I released my white-knuckled grip and raised my hands. Because that’s what you did on the Comet. I was a cool kid. And I owed it all to my father. As far as I knew, he never rode the Comet again. But during the following years, you couldn’t keep me off that glorious ride. I don’t know if I really was a cool kid, but by the time I got to Junior High, pretty much all I rode was the Comet. And like those teenagers before me, I re-rode. Unfortunately, the Forest Park Highlands burned down in 1963. I was in high school at the time, but I think the school picnics had already ended. I had other mountains to conquer. I don’t remember mourning. Interestingly, two rides didn’t burn down that day: the Comet and the equally-iconic and very beautiful Carousel, which still exists in Faust Park in Chesterfield, MO. I haven’t paid the carousel a visit, but I can still hear the ringing of the bells, the music, the bright lights. Those two rides represent my entire childhood: from the point when the Carousel was exciting to the unbelievable thrill of the Comet. 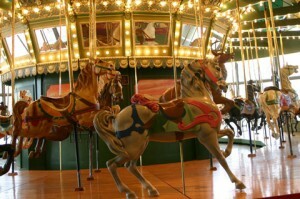 Those rides took me from childhood to – well, maybe not adulthood, but that next place between childhood and adulthood. Also, one of my favorite school bus drivers, Carl, was a French-Canadian roustabout – compact, muscular, handsome – who worked the Ferris Wheel at the Highlands during the summer. A rather heroic figure to us riders – someone I should definitely write about! And now, if you’re feeling very grown-up, take a ride on the Comet. This entry was posted in Friends and Family, Growing Up, Uncategorized. You can leave a response. Follow any responses to this entry through the RSS 2.0 feed.